Six boats came out to play with a welcome return of Sweet Friday, Len Cheshire leading the pack off at 13:48:30 for the second pursuit race. He was followed by Aries, David Mitchell two and a half minutes later. The course was No 147, which gave a beat to Castle Buoy rounded to port. A starboard run to Vilt, again to port then back to the club Turning mark. Aurora, Mandy Owens then went off at 13:53 and played catch-up with the two boats ahead, her freshly varnished mast creating minimum drag on the upwind leg. Trifle and Popincoota were next away at 13:57! Yeah talking to Jess & Nigel in the pub later we hit it right on the button with inches to spare. Jane Goddard on Popincoota was a tad late following us up the ever-narrowing fairway. Bob Chapple on Wilkie had the late start, 13:59:30 having done well the previous week. ’Twas a goodly beat towards Castle. Which way to go? lifters! headers! tide! back eddies! and an ’orrible lop left over from the previous southerly! We elected to clear the docks and tack onto port inside Governor and follow Pendennis to the point. Popincoota came with us and Wilkie went eastward toward St Just. The two Folkboats and Moody 27 were split either side of the crow’s flight to Castle in the near distance. We tacked over as the lop was getting unbearable and Popincoota stood on. Wilkie was way down to leeward and then tacked to come up to join us. Mean while Aries appeared to round the mark ahead of Sweet Friday followed by Aurora. Popincoota beat us to the mark and we were just in front of Wilkie. A starboard pole kite run ensued with Jane & Al white sailing toward Vilt and Wilkie minus kite behind. 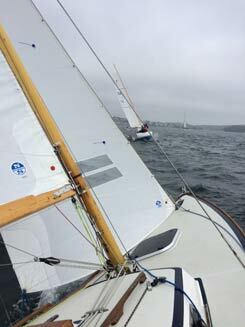 We saw the two Folkboats round Vilt ahead of Len and then Wilkie cracked a late spinnaker near the mark. A gybe ensued at the mark and lucky for us the wind came right aft just before the Vilt and a good gybe occurred! Unfortunately the now leeward downhaul was on and a gust tipped us up twice with Wilkie close on our stern. I called to Bob “Don’t get too close as I’m not sure where were going”. A couple of lurches and freeing of the offending downhaul saw us on our way toward the inner harbour, chasing Jane and watching Bob below us minus kite as he had also wiped out big style!! So we saw Aries just ahead of Aurora at the turning mark and then playing cat and mouse all the way across to Castle, followed by Sweet Friday. Sue Clark called the new shorten course – Castle, port, finish – on the radio. We rounded the turning mark just behind Popincoota and just ahead of Wilkie. Tacks were traded down the harbour and we again went down the western shore and were headed below Jane due to the now vicious chop. Wilkie stood on and tacked later giving her the advantage over both of us out towards Governor. We plugged the chop and tacked for Castle to see Popincoota way down to our lee Wilkie had made ground on us. That’s it folks: the drag race to the finish ensued and the places as above. Len Cheshire came up and called Bob Chapple “two minute Bob” as he reckoned Wilkie slowed coming up the harbour so as not to lose two minutes on adjustment next week. Tactical series sailing folks. Thanks to Nigel and Jess as Race Officers, Sue Clark as results and spotting, Pauline Chapple for Victoria sponge to die for, and Giles still in his big blue boat! Numbers were down this week due to the big boys grinding their COGS for a challenging beat to Fowey and a hangover beat against a strong, wet Southwesterly back tomorrow. See you all Tuesday for some sunshine sailing? Fingers crossed.